*All airsoft guns must be concealed in a gun case, bag or original box until inside Buffalo Battleground. Players caught cheating will be ejected from the field. If caught a second time, you will be asked to leave for the night with no refund. No illegal drugs or alcohol are permitted. Game control staff or referee decisions made on the field are final. Arguing with field marshals is grounds for immediate ejection. Orange tips are required to play at Buffalo Battleground. If your Airsoft weapon do not have an orange tip, we will provide you with orange tape so that you are in compliance with our rules. If you use your own orange tape, make sure that the size of the tape is no smaller than the size of standard electical tape. Barrel socks are required to play at our facility. They are re-enforced fabric covers that go over the barrel of an airsoft weapon to prevent accidental discharge. Acceptable barrel covers must be specifically made for airsoft weapons and have a bungee cord attached. Barrel socks are a one time purchase and can be bought at our facility for $5. Each players guns will be chronographed at check-in using .25 bb's. Allowable guns must shoot less than 351 fps. Any gun shooting over these standards must be de-tuned to meet this requirement before being allowed for use in the playing field. Long sleeve shirt or hooded sweatshirt is recomended. Long pants required. Shorts may not be worn. Hard-shell kneepads are recomended but not required. Gloves are recomended but not required. Bright red “kill rag” Is recomended but not necessary. Shooting glasses or “operator-type” sun-glass styles are NOT permitted even if ballistically rated. Biodegradable BB's, while strongly encouraged, are not mandatory. Any weight of BB may be employed. Players who are using field rental guns from us are required to buy and use quality BB's sold at the field by staff. You may NOT use your own BB’s in our guns. Double-Tap - When shooting an oppenent always be curteous. Squeeze your triggar finger a max of two times in succession. If your oppoenent doesn't call their hit, then repeat. If you are overshooting, you will be warned once, the second time you will be eliminated from the game and the third time you will be asked to leave. Airsoft bb's hurt, there is no reason to light another player up more than twice in succsession. Point-blank shooting is discouraged. Players who encounter opponents at point-blank range (less than 10 feet away) you must yell "Surrender". Your opponent will have the option to either surrender or run. If they surrender they are considered out and you will NOT shoot them, if they run, you have may shoot them. If a player says “Surrender!” to you, you CANNOT shoot them. Your only option is to surrender or run. If you shoot them you will be considered out and they will remain in the game. You may only surrender two individuals at one time. It is not realistic that one person could surrender a group of more than 2 people without being shot themselves. If two players encounter each other in their forward arcs within 10', and recognize that neither player was at a disadvantage yet engaging that close would be a safety issue, either player may call out "Parley!" Both players will walk 15' in the opposite direction of each other and resume play. All hand grenades have a 15' kill radius from the point of detonation. All players, friend or foe, within 15' are considered dead. Unless protected by 2 walls. NO exposed weapons or worn tactical gear is allowed when outside our facility. This includes the following. All Airsoft weapons and tactical gear should be transported in the trunk of your vehicle when arriving or departing Buffalo Battleground. 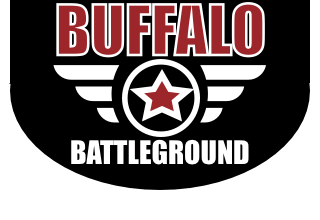 Airsoft weapons must be in a case, bag or original box when arriving or leaving Buffalo Battleground. Wrapping Airsoft weapons up in blankets or other cloths is NOT acceptable. NO part of an Airsoft weapon should be showing. If your weapon is not in an acceptable form when arriving, you will not be allowed to play that day. Tactical gear is only allowed inside the building and NOT permitted outside the facility. This includes vests, plate carriers, gun holsters, helmets, etc... BDU's or camolfauge are permitted in and outside the building. It is strongly recommended that players mark or inscribe radios, magazines, pistols, and other small and easily lost items with their name or other form of identification, such as your backtag number. Bringing in your own food and drinks is NOT permitted. 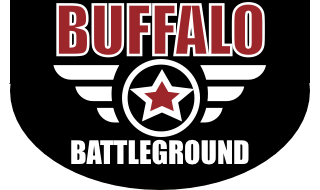 All food and drinks must be purchased from Buffalo Battleground. The only acceptable outside drinks is water but it must be kept in a hydration pack. Fire extinguishers are located in the staging area and in the playing area.) First aid supplies are located in the staging area.